Today it's exactly a month until the festival starts! Choo-choo! Hopefully you've already booked your tickets, and can now settle down and have a listen to the second in a series of Indietracks 2009 podcasts. The podcasts have been put together by Josh Morris of Radio Cardiff, who may have accosted you with his microphone at some point last year and, by all accounts had an, ahem, interesting Sunday night (you'll have to listen to the podcast to find out what he was getting up to!) 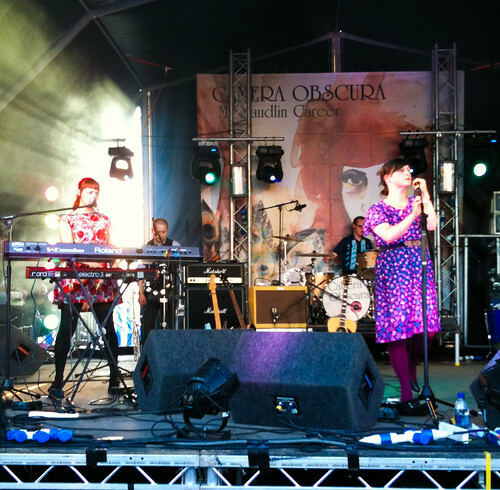 This second podcast features exclusive interviews with Camera Obscura, Stereo Total and Pocketbooks, and really, really makes us get all nostalgic and misty-eyed about last year. Aw. You can stream it right to your house-bound computer or freewheeling portable internet device from this Soundcloud link or you can download it forever for future consumption from this Mediafire link.